Buy 2 or more for only 22.99 each with free shipping!! The Next Generation In BCAA Formulas, Now With Added Caffeine & Antioxidants! 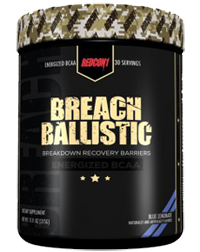 Breach Ballistic is the next generation in BCAA formulas, now with the added benefit of caffeine and antioxidants. Breach Ballistic dramatically aids in recovery, performance, and is shown to decrease a considerable amount of muscle soreness. With the added brain enhancers it makes for a highly effective performance drink that can be consumed throughout the day to build muscle and keep you mentally locked in to perform at your best – regardless of the task at hand. BCAA’s account for 1/3 of muscle tissue. Simply put, if you are not supplementing with BCAA’s you are not maximizing your performance. And as a serious weight trainer or athlete we are constantly breaking down muscle tissue through exercise making Breach Ballistic a necessary staple in your supplement program. Other Ingredients: Citric acid, natural and artifical flavors, malic acid, sucralose, acesulfame-k, maltodextrin, silica. Nutrex Amino Charger +Hydration Peach Pineapple 30 Servings, BOGO Available! !